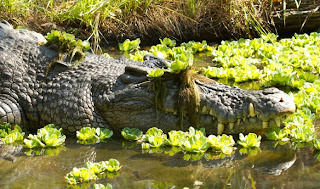 Croc Blog: Can crocodiles use tools? camouflage? Photo by Brandon Sideleau. A blog article over at Tetrapod Zoology (a site that you should bookmark and read regularly if you're not doing so already, because it's rather good) is running a story about tool use in crocodiles and alligators. Yes, that's right, tool use. We know that crocs are much smarter than people give them credit for, but are they really capable of using tools as well? The article references a paper that's just been published digitally by Dinets et al (2013). They describe mugger crocodiles at the Madras Crocodile Bank appearing to balance sticks on their snout and sitting under nesting egret colonies. Egrets use sticks to build their nests, so they spot some floating in the water, land next to them, and get a nasty shock when they try and pick one up. The paper describes this as a deliberate attempt by the crocodiles to mislead the egrets into landing within striking range, with the sticks as the tools in the ruse. It's a compelling idea. Seeing crocodiles with sticks, leaves and other vegetation balanced on their head isn't new, we've all seen them doing it. We have a large saltwater crocodile who lives in a pool covered with Fistia spp, an aquatic plant that makes a fetching hat when he surfaces underneath one. I suspect many of us have wondered whether this plays any kind of functional role, or whether it's simply the crocodile not caring either way whether it has plants on its head. I've seen crocodiles surface in such dense vegetation that they can't actually see, and shake their head to clear them off. Other times they seem to sit quite happily without apparently noticing. 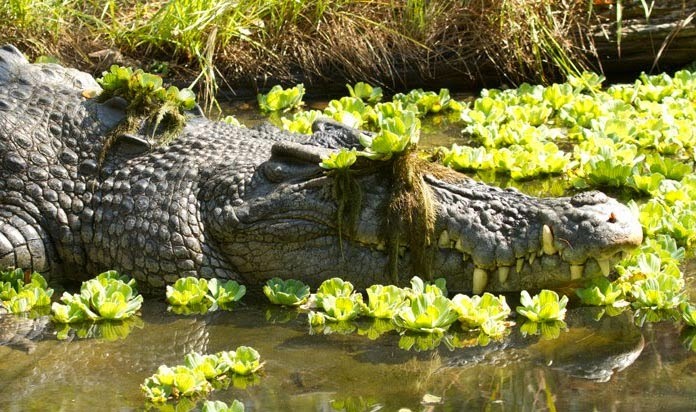 If you were a bird and saw a nice bit of vegetation and didn't recognise what was underneath it, you might think that crocodiles could learn to use this vegetation to increase their chances of catching prey. It's certainly feasible, but proving it is another matter entirely. The Dinets et al. study suggests that mugger crocodiles only balance sticks on their head and sit under egret colonies during egret breeding season. This certainly supports the idea that something deliberate is going on, although it's still possible that it's incidental; perhaps the crocodiles spend more time sitting under egret colonies during egret breeding season, and those that have sticks on their heads might get lucky when an egret gets fooled? To counter this, the authors point out that the area around the egret colony doesn't have many sticks, suggesting that the crocodiles must bring them across to the colony for them to use as bait. Even if it is purely coincidental at first, crocs learn fast, and this might reinforce behaviour that makes sitting under a nesting egret colony with sticks on your head more likely. I think it's a great observation, even though there's still a skeptical part of my brain wondering whether there might be another explanation. I'd love to see more work done on this, because a study like this opens up a whole set of really interesting questions. Science! What is true, though, is that crocodiles do some amazing and unexpected things, and it wouldn't surprise me if they were this cunning. We know that they're capable of it. The relationship between the size of the brain and what we call intelligence or problem solving skills may be less meaningful than we’re prone to think. Einstein had a smaller than average brain (although certainly larger than a crocodiles.) It may be that crocodiles, like most animals, are highly intelligent, but in ways that are uniquely adapted to their needs (Duh!) Perhaps, if we stop judging every other species in relation to ourselves we’d all be better off, especially the animals. Good article!